I love a good old-fashioned romance. For someone who read and watches Jane Austen with envy, I am always on the look out for something that makes my romantic fantasies stand to attention. I’m a big fan of Hester Browne (her Little Lady agency series is a must read), if anyone can match Ms Austen’s romantic, humourous touch it’s her. Her books somehow sparkle. 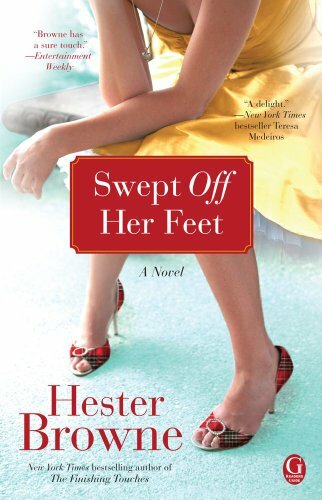 I just finished Swept off her Feet, a contemporary romance that transports you to a stately home in the Scottish countryside. Evie the main character is a girl after my own heart – she is looking for her own Austen romance and gets stuck in daydreams about life and love in the past. She’s sent to the house to help value their antiques and meets moody heir Robert who hates the place and wish his parents would sell it. Add in a Scottish ball with traditional dancing and you have a funny, romantic treat. The book contains all the ingredients I wish my own life contained but alas old-fashioned romance doesn’t knock at my door every day (or ever!) so I have to live it through books like this instead. I might have to crack open my Pride and Prejudice box set this weekend! Are you a fan of reading romances or are you far too cynical for all that? That’s a shame, I have a big pile that need reading! It sounds cute and a nice read! I’m not going to lie here, I do sometimes read a good romance and I love Pride and Prejudice and other Jane Austen stories but sometimes my cynicism gets in the way. 😛 I’m more of a fantasy read but if there’s a good romance in there all the better! As long as it’s not too angsty..
Just finished Edith Wharton’s ‘Summer’ which was great and also a new book ‘Eden’s Garden’ which was fabulous. Have to make time for the romantic novel occasionally. Definitely 🙂 thanks for commenting! I love a good old fashioned romance too, and this book sounds just up my street! I don’t think of myself as cynical, but for some reason, the thought of reading about romance puts me to sleep. I enjoy witnessing it grow in real life, but it feels peripheral to me somehow. I was surprised to actually enjoy writing a budding romance in my last novel, which I anticipate editing somewhere around 2018. And I was sad when, as the novel progressed, I saw that it wasn’t going to go where I expected. So you could say there’s some hope for me on the romance front! I think we all need a little now and then. Thanks for the suggestion. I haven’t read anything that compares to a work by Austen, so this will be an addition to my reading list! It made me smile which is a big thumbs up! I love Jane Austen so this book might end up on my to read list. 🙂 I don’t tend to seek out romance novels, though I enjoy a romantic element in a story. I like hodge podge books. A dash of paranormal, a sprinkle of romance, a tablespoon of mystery–all blended together. Knew you had good taste 🙂 I agree, it’s nice to have a few elements in there! Really wanted to move into the house in it although I’d have to spend most of the time huddled around the fire as it sounds freezing!